View of Ollanta from the Pinkuylluna ruins. Photo taken by Kelly. After three plane rides, a few delays and a taxi ride, I finally made it to Ollantaytambo (AKA Ollanta), the lovely little town where I will be spending my next six months. 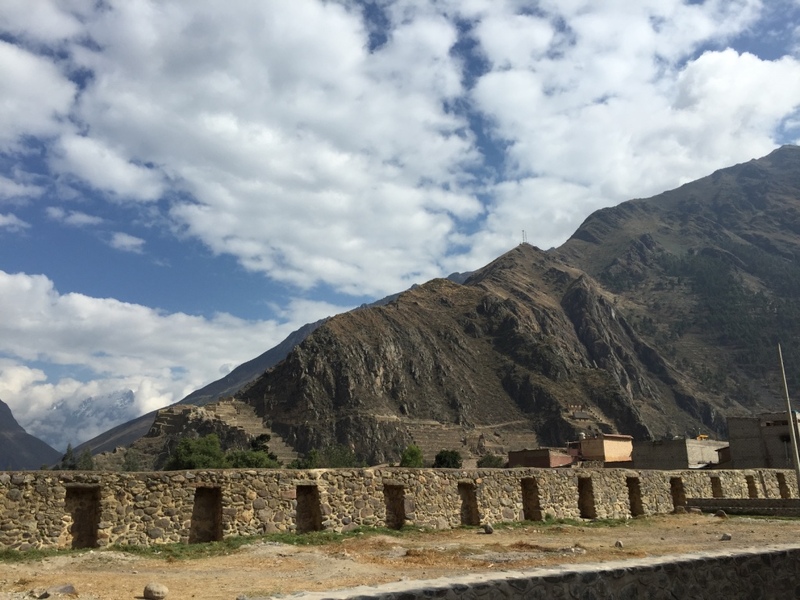 Upon arrival to Ollanta, we hit our first obstacle – we could not reach the homestay coordinator and we did not know the address of my homestay family! After about 20 minutes of hanging out and calling a million people, my homestay mom and her daughter appeared. We walked about five minutes to their house in the Old Town (Pueblo Antiguo) neighborhood of Ollanta that was built by the Incas. 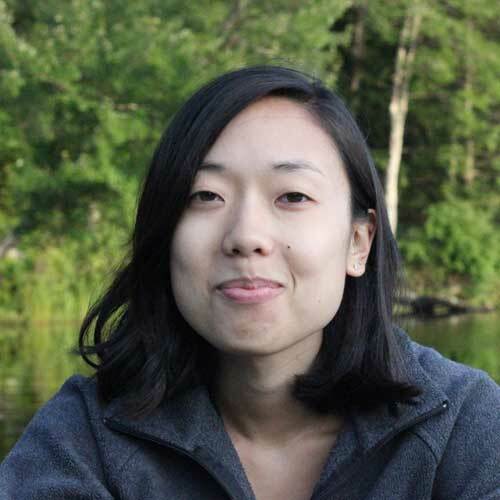 From the start, my homestay family (mom, dad, 15-year-old and 5-year-old daughters) were nothing but hospitable. In my one week, I’ve been exposed to typical Peruvian foods, a one-month anniversary of a death, and a birthday. Breakfast is typically fresh juice and bread, or oatmeal. In my homestay, lunch and dinner are often the same meal, with lots of rice and potatoes. The best dish I’ve had was lomo saltado, which is beef, tomatoes, onions, French fries and rice. As for the mourning and the birthday, they were similar, with plenty of delicious food, beer, and half Spanish and half Quechua (the local language) conversations. Ollanta is a beautiful little town that seems to be half tourists and half locals, due to its proximity to Machu Picchu. I knew it was touristy, but I was still surprised at how many tour buses pass through the town daily. There’s a market where you can get produce, meat, books, clothes, and my favorite, fresh fruit juice. In the plazoleta (the main plaza), there are tons of stores and restaurants, all prominently advertising their WiFi. There are two sets of ruins right in Ollanta. On one of my afternoons, I explored the free Pinkuylluna ruins that provide breathtaking views of Ollanta (plus a leg workout!). Right next to the Sacred Valley Health/Ayni Wasi office. Photo taken by Kelly. My first week with the nonprofit Sacred Valley Health (SVH), known as Ayni Wasi in Peru, was orientation and information overload. 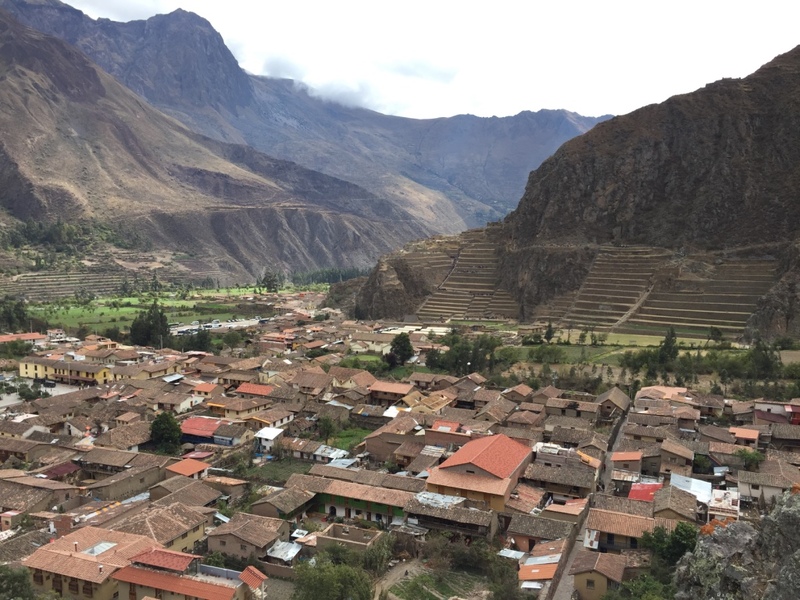 In addition to tours of Ollanta and the neighboring town of Urubamba, about 30 minutes away, I had meetings with every staff member to learn about his or her role in the organization. SVH’s main program is a promotora (community health worker) program focusing on health education. SVH has trained over 20 promotoras in 13 communities, and we expect to train an additional 30 or 40 more in existing communities in the next year, in response to demand from our population served. Promotoras are key health advocates in their communities, which can be hours away from the nearest health clinic by foot, delivering important health information, providing basic first aid, and conducting targeted house visits for high-risk patients. In my capacity as a Community Coordinator, I will support two to four promotoras and act as their SVH liaisons. This includes promotora trainings, helping them prepare for presentations and managing relationships with important community leaders. This is the perfect opportunity to put my Master of Public Health degree to work, all while learning about another culture, and hopefully improving health outcomes over the long term. Besides being tired from the travel and the adjustment to the high altitude, I had a great first week. I’m excited to dive into my work at SVH, continue practicing my Spanish, and explore Peru more!